The first step in planting grass seed correctly is to prepare the soil. Do this by removing all unwanted vegetation from your yard. Use a non-selective herbicide that contains the active ingredient glyphosate (Round-Up) that will effectively kill a variety of undesirable weeds. Be careful –a non-selective herbicide will attack all plant life so be sure not to spray or drift any surrounding vegetation that you want to keep. Apply the herbicide to healthy growing weeds because healthy plants absorb the chemical quicker. Let herbicide dry on plant leaves for about 12 hours, and after a day or two they’ll begin to wilt. If working with a small area, you’re better off putting in a little elbow grease and simply pulling the weeds by hand or with a garden hoe. Next, dig into the ground and examine the soil’s consistency. Soils range in consistency from sandy (loose) to loamy (even) to clay (compact). Sandy soils drain quickly and support good root growth. Compact soils containing too much clay draining slowly and make root growth difficult. The best soil for healthy grass growth is made up of about 50% to 60% coarse sand with the rest composed of finer loam and clay. Most soils are modified by adding organic soil amendments like plant parts, shredded bark or manure compost. Figure out what to add to your soil by taking a soil sample and having it analyzed at your local Agriculture Extension Office or any local colleges that may have a plant science program should be able to analyze your soil sample. Remove 10 to 12 soil samples from your yard, each at a depth of 3 inches. The analysis should report nutrient levels for nitrogen, phosphorus and potassium, and help a technician identify what other soil amendments should be applied. Wet soil and let drain for two days. Roto-till soil as deep as possible. Wet soil again and let drain for another two days. Pull any weeds that germinate. Add organic matter and grass fertilizer on top of tilled soil. Roto-till one more time and as deep as possible. Throughout the process, be sure to remove any weeds, stones, sticks or other rubbish that surface, especially after roto-tilling. Level your prepared soil as best as possible, letting the new soil settle naturally revealing any low spots. Add water to speed up the settling process. Fill in low spots with new soil or organic compost mix and then rake the soil creating small grooves along the surface; this creates a soil texture optimal for seed germination. At this point, your lawn is ready to be seeded! There are grass variations to suit any gardening taste, but selecting the right kind of grass relies on factoring in your geographical location, the time of year and the climate. Most types of grass seeds are best planted when daytime temperatures range from 70° to 80° during the day and 55° to 60° at night time for at least six straight weeks. Planting Grass Seed Center’s grass seed types section contains more information on ideal planting conditions for different grass varieties. On the clickable map in the sidebar to the upper right, click on your state for a list of recommended grasses that are suited to your growing region. Plant grass seed on a windless day; this prevents seed from blowing away. 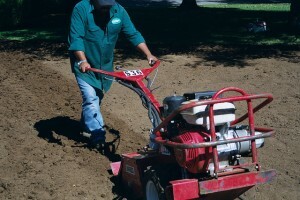 Use a spreader or a mechanical seeder for an even application to prevent your lawn from developing gaps or bald areas. A well-seeded lawn discourages weed growth by competing for space, sunlight and nutrients. Fill your spreader with 1/2 of your grass seed and apply it to your lawn in one direction. Then, switch directions and apply the other half of your seed to distribute seed evenly. Lightly rake the seed into the ground to encourage good soil contact to the seed. Finish the job by pressing the soil lightly with a roller. Renting a roller or investing in your own is a good idea, especially if you’re planting in a large area. If you expect hot, dry weather or dry winds, put down a thin layer of mulch or compost to hold in the moisture. When installing sod, repeat the same steps above, making sure that the soil stays firm so that the sod won’t sink when walked on. Lay a 1/2-inch layer of fine sand between the soil and sod to promote faster rooting. Roll the sod in both directions after it’s installed and water twice daily until it roots. The sod has rooted if you can no longer lift it with your hands. Visit our Grass Sod Installation Tips section if planing on using grass sod. Water the soil thoroughly and keep it dark with moisture until all grass seed germinates. However, be careful not to wash away the seed; just make sure the seed bed doesn’t dry up. You might want to install an irrigation system with sprinkler heads to cut down on time-consuming hand-watering. During hot, dry weather, hand-water any developing dry spots. Read the Watering New Lawns post for more on how to promote seedling germination and growth. One week after grass seed has fully germinated, pull out any weeds that have come up. 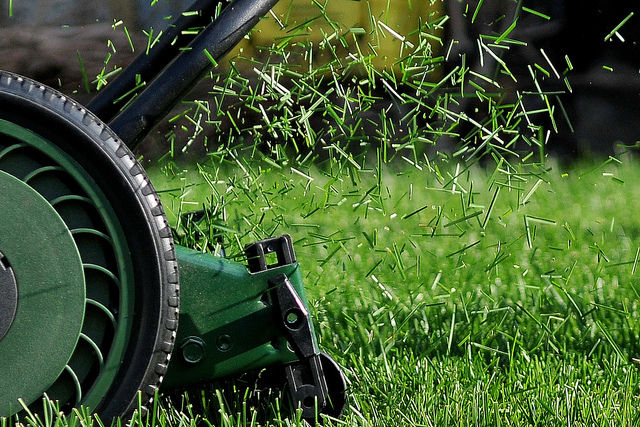 Save your first mowing until the grass blades are two to three inches high; use a lawn mower that has very sharp blades as the grass will be fragile. Click here for 8 Great Lawn Mowing Tips! Congratulations! If you’ve followed all these steps, then you’re working on the makings of a beautiful, dense lawn of lush grass. Planting grass seed correctly may not be the easiest task, but when done correctly, the pleasure of admiring a healthy lawn for years is worth every bit of time and money invested. For a summary of the process, take a look at this quick guide. Enter your details below to receive free e-mail updates!